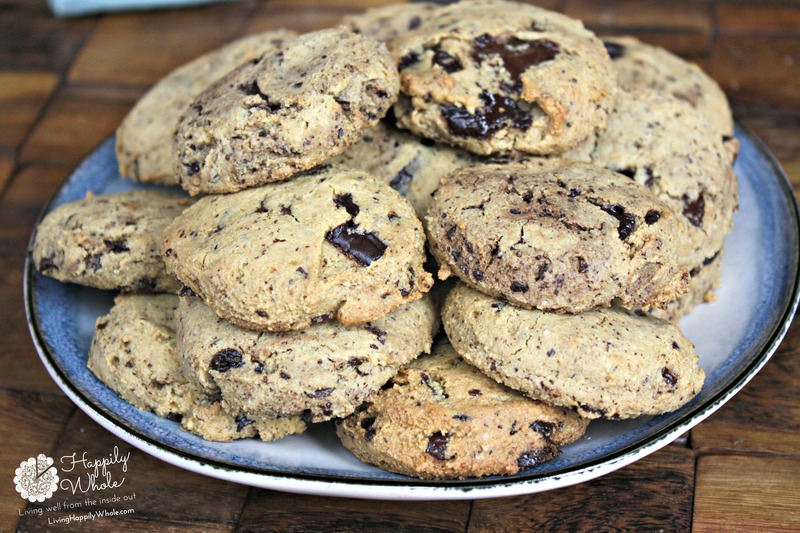 Best Grain Free Chocolate Chip Cookies from my Kitchen! Sometimes God gives me grace in the kitchen. 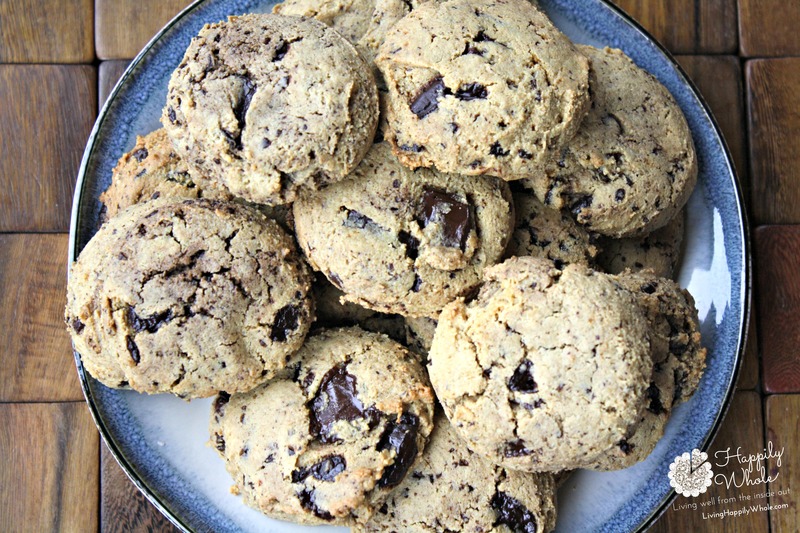 I'd been in a cookie slump and then these happened just in time for healthy summer sweets. After all, when your the baking mama on the block, kids (and moms) sometimes flock and I want to feel good about what I feed them! They are the best grain free chocolate chip cookies I've come up with. 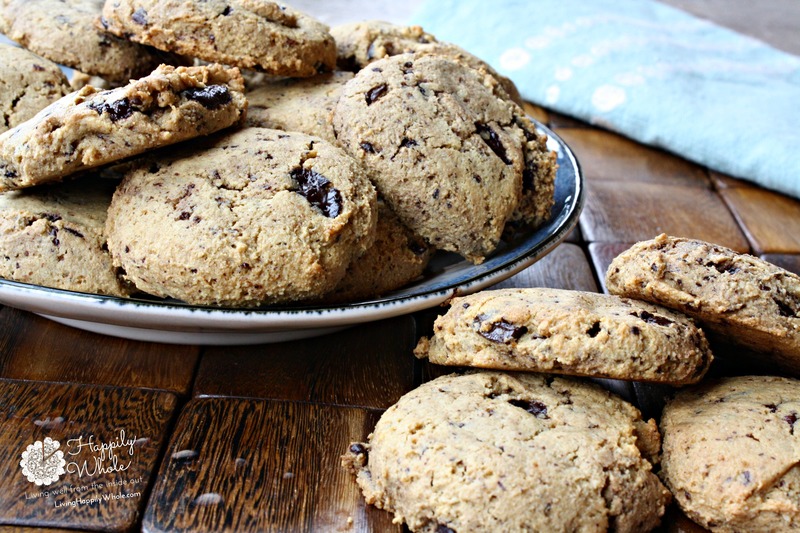 They aren't much different from this older recipe: almond flour chocolate chip cookies. But, I'd been longing for a bit of a different texture a more traditional taste. So, back to the drawing board (or, in my case, recipe notebook) and with just a few tweaks in the process and ingredients, I created a cookie I'd serve to anyone...under the guise of traditional cookie goodness! Thank you God, Creator of everything good, for real-foods that nourish our bodies while our tastebuds interpert a real treat! I have attempted making my own grain-free recipes (many of which were not post worthy) and I've also tried the likes of other bloggers' recipes that tempted me with their photos but I wasn't pleased with the fruition. Stink on you, Pinterest, for tempting the eye with concoctions not taste-worthy after the effort! No offense, but I am trying my best to appeal to the masses over here at Happily Whole...and for those in my home, which often consists of several children, all with taste buds trained for the real-cookie-deal. I want the new-to-clean-eating people to see how real foods really are delicious when put together well! Well, these cookies are the real-deal-imposters. I've been able to give these little ditties to just about anyone. The taste and texture make for a a great grain-free soft texture that not only holds together but also satisfies even the more critical kid. Plus, I love them with a cup of coffee...or after my kiddos go to bed, a time when I can sit, savor and enjoy. In fact, in all of my evening will power (or lack thereof...read this post), I have frozen these bad boys to prevent me from eating half the batch, but it didn't work! I found myself gnawing through a frozen cookie and enjoying it's texture and cool taste, too. So much for that strategy! Here's a couple other cookies or bars you may want to check out if you want to compare...or if you're simply in a healthy baking mode to have some 'school's out for summer' treats ready! Dark Chocolate Nut Butter Bars --I LOVE THESE! Chocolate Quinoa Breakfast/Snack Bars--perfect for snacks and even a mildly sweet breakfast treat. The quinoa adds the perfect amount of protein. Dark Chocolate Toasted Seed and Nut Bars--so these are a great snack to try and they make a big batch you can freeze. There's nothing better than making your own granola bars...because YOU KNOW WHAT'S IN THEM and can recognize all the ingredients. And, here's the best part of this recipe: IT IS EASY. Seriously easy. Preheat oven to 325 degrees F. Prepare your cookie sheets with parchment paper. Put all of the ingredients except the chocolate chips into a large food processor (yes, I LOVE my food processor). Process it until well combined. You may have to stop it and scrape down the sides once or twice. Add the chopped chocolate or chocolate chips and either manually stir or pulse in until evenly mixed into the batter. Scoop with a medium cookie scoop (or about the size of 2 tablespoons) onto parchment paper prepared cookie sheets, about 2 inches apart. Gently and slightly flatten with the back of a wooden spoon or your hand. Bake for 12 minutes, or until golden and still soft. Let cool on the cookie sheet for a few minutes and transfer to a cooling rack. **If you do not have a large food processor, you can make this recipe in your stand mixer by combining the dry ingredients in a bowl and then adding the wet ingredients and mixing to combine well. I like the results from the food processor better because, for some reason, the dough and cookies just come out with a better texture. SEE NOTES for freezing suggestions. * I love using one of these two brands of almond flour. The grain is fine and it combines well for baking recipes. **This recipe freezes extremely well. You can bake the cookies and then freeze them to keep them fresh by lining them in a container with parchment paper between the layers. Or you can prepare the dough, scoop it onto cookie sheets as if you are going to bake them but place them close together on the sheet and put the cookie sheet into the freezer. Once the dough balls are frozen, you can remove them from the cookie sheet and put into a gallon sized freezer bag. When you are ready to bake them, simply put the cookie balls onto parchment prepared cookie sheets and bake at 325 for about 15 minutes.